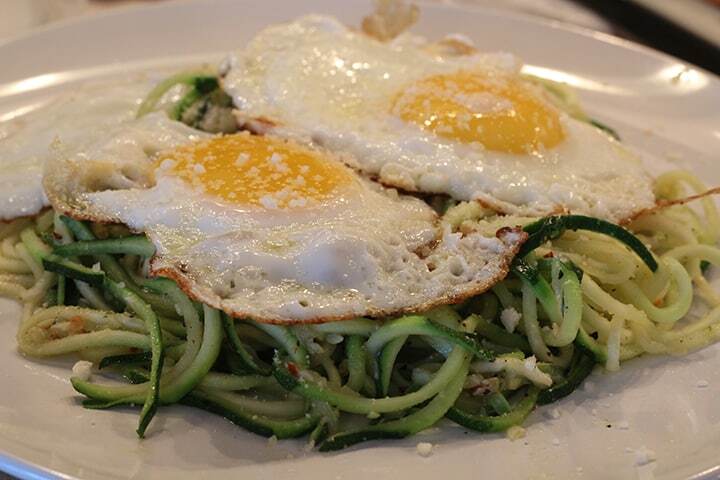 Mark Bittman, a food columnist for the New York Times, wrote an article in 2008 about “Spaghetti Fried Eggs,” an adaptation from a dish published by Arthur Schwartz (once the NY Daily News restaurant critic and food editor.) Often referred to ask “the poor man’s spaghetti,” this simple meal formerly consisted of not much more than fried eggs, pasta, garlic, olive oil and Parmesan cheese. That poor man might have been penniless, but he ate well! 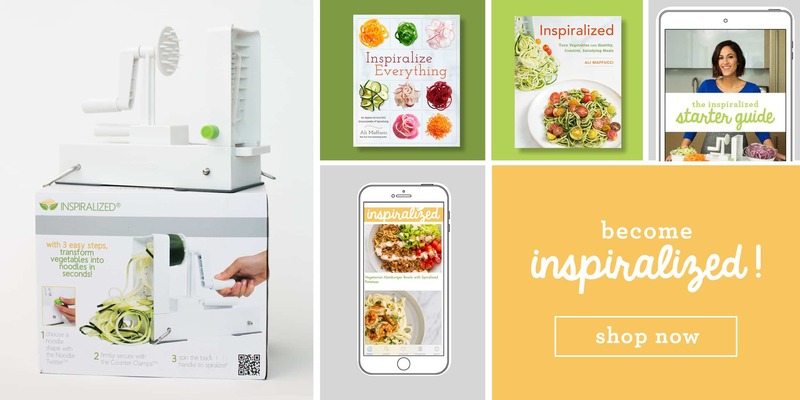 Once I got my hands on the recipe, I knew exactly how I wanted to Inspiralize it! 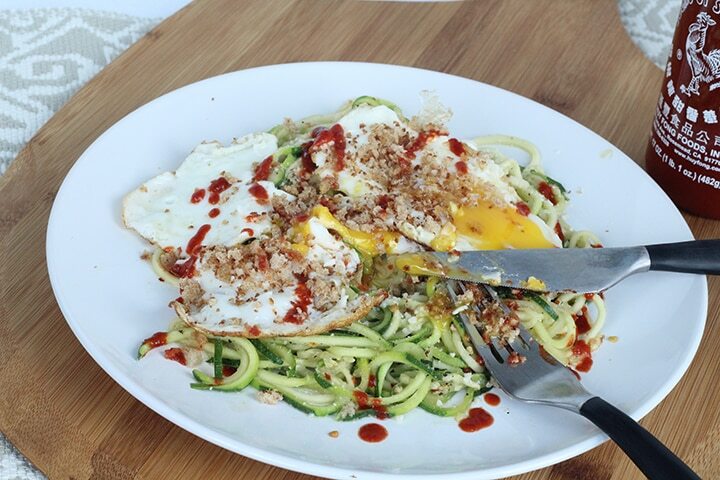 The flavors of the zucchini really come out when paired with minimal ingredients, and the creaminess of the runny yolks give the noodles a saucey consistency. I really like spice, so I decided to throw in some red pepper flakes and…. sriracha! Let’s talk about sriracha for a minute… it’s a hot sauce from Thailand, mainly used with seafood or as a condiment for fried noodles. Bon Appetit actually published a marinara sauce recipe using it! My boyfriend’s business partner uses it like ketchup. It’s pretty life-changing….. I suggest you go buy it and make this recipe tonight! 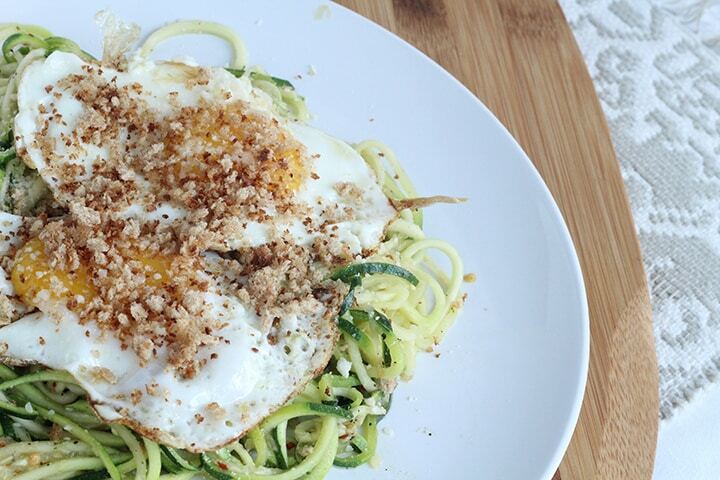 I’ve transformed “the poor man’s spaghetti” into “the poor girl’s zucchini spaghetti” ….. If you’re afraid of spice, forget the sriracha and enjoy the amazing textures and flavors of this dish without having to clear your sinuses and eat it with a box of tissues. Place bread in food processor and pulse into breadcrumbs. Set aside. Place a small skillet on medium-high heat and place in half of the tbsp of olive oil. Once heated, add in the breadcrumbs and cook, stirring frequently for about 2-3 minutes or until crumbs are "toasted." Set aside. Put a large skillet on medium heat and coat with cooking spray. Add in the zucchini pasta and season generously with salt and pepper. Toss to combine and then add in red pepper flakes and garlic powder. Cook for about 2-3 minutes or until zucchini softens. Place onto a plate, sprinkle with the Parmesan cheese and set aside. 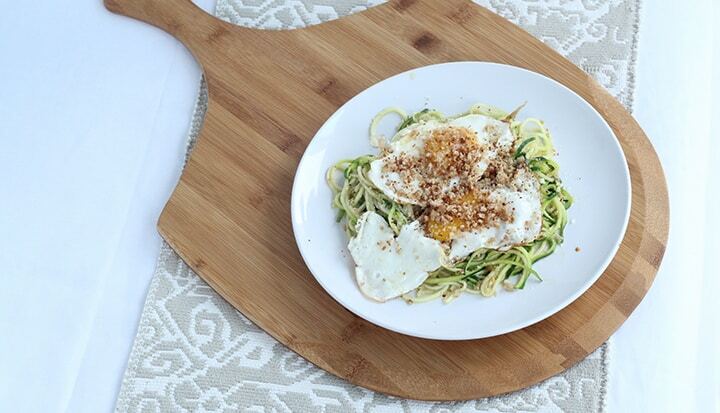 While the zucchini spaghetti is cooking, place a medium skillet over medium heat and add in the other half tbsp of olive oil. Once heated, crack the eggs into the skillet, trying to keep them separate. They will flow into one another, so when they begin to set, divide with your spatula. Let cook for about 2-3 minutes or until eggs are fried but yolks are still runny (the whites should be fully set). 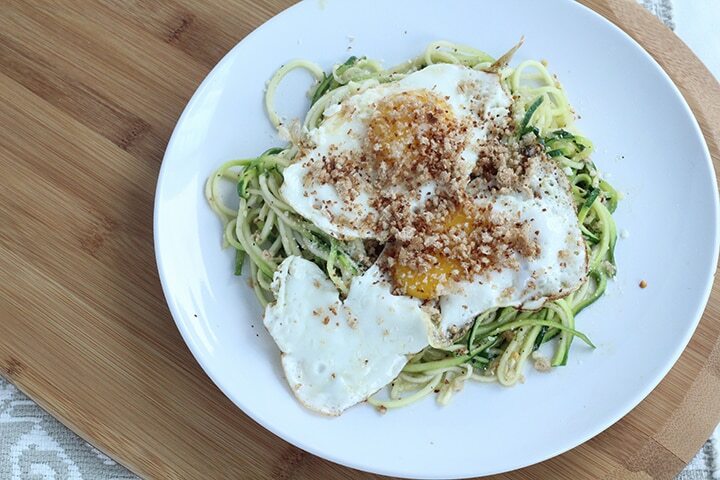 Place the fried eggs on top of the zucchini spaghetti and garnish with the Parmesan cheese and top with breadcrumbs. 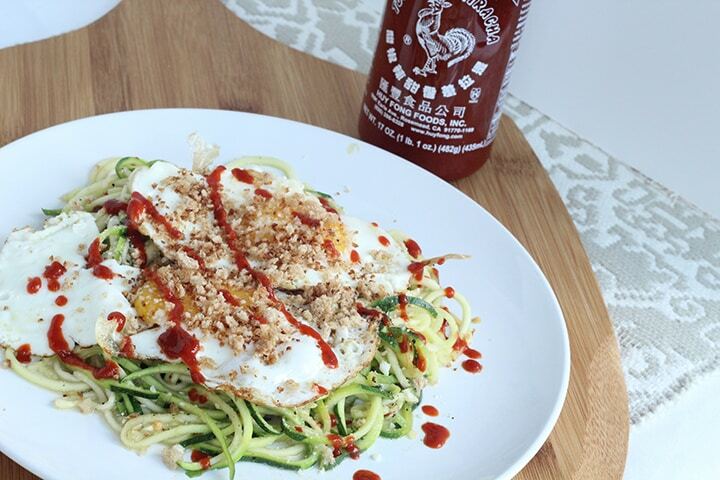 If you’re daring, squirt sriracha on top! Grab a box of tissues …. it’s worth it! I made this and it was wonderful however it seemed like the recipe called for a lot of garlic powder. I didn't use near as much but was wondering if that was an error in the recipe? It really came out tasty on my first try itself. Hi Stephanie! Yes - let us know how it turns out!